I like to think of The Econometric Game as the World Championship of Econometrics. There have been 17 annual Econometric Games to date, and some of these have been featured previously in this blog. For instance in 2015 there were several posts, such as this one. You'll find links in that post to earlier posts for other years. I also discussed the cases that formed the basis for the 2015 competition here. In 2016, the 18th Econometric Game will be held at the University of Amsterdam between 6 and 8 April. About six months ago I wrote a post titled, "Readers' Forum Page". In a post in today's Inside Higher Ed, Scott Jaschik discusses the latest annual jobs report from the American Economic Association. "A new report by the American Economic Association found that its listings for jobs for economics Ph.D.s increased by 8.5 percent in 2015, to 3,309. Academic jobs increased to 2,458, from 2,290. Non-academic jobs increased to 846 from 761." "Economics, like most disciplines, took a hit after 2008. Between then and 2010, the number of listings fell to 2,285 from 2,914. But this year's 3,309 is greater not only than the 2008 level, but of every year from 2001 on. The number of open positions also far exceeds the number of new Ph.D.s awarded in economics." "As has been the case in recent years, the top specialization in job listings is mathematical and quantitative methods." Wishing all readers a very special holiday season! Agiakloglou, C., and C. Agiropoulos, 2016. The balance between size and power in testing for linear association for two stationary AR(1) processes. Applied Economics Letters, 23, 230-234. Allen, D., M. McAleer, S. Peiris, and A. K. Singh, 2015. Nonlinear time series and neural-network models of exchange rates between the US dollar and major currencies. Discussion Paper No. 15-125/III, Tinbergen Institute. Basu, D., 2015. Asymptotic bias of OLS in the presence of reverse causality. Working Paper 2015-18, Department of Economics, University of Massachusetts, Amherst. Giles, D. E., 2005. Testing for a Santa Claus effect in growth cycles. Economics Letters, 87, 421-426. Kim, J., and I Choi, 2015. Unit roots in economic and financial time series: A re-evaluation based on enlightened judgement. MPRA Paper No. 68411. Triacca, U., 2015. A pitfall in using the characterization of Granger non-causality in vector autoregressive models. Econometrics, 3, 233-239. When we're dealing with seasonal data - e.g., quarterly data - we need to distinguish between "deterministic seasonality" and "stochastic seasonality". The first type of seasonality is what we try to remove when we "seasonally adjust" the series. It's also what we're trying to account for when we include seasonal dummy variables in a regression model. On the other hand, "stochastic seasonality" refers to unit roots at the seasonal frequencies. This is a whole different issue, and it's been well researched in the time-series econometrics literature. This distinction is similar to that between a "deterministic trend" and a "stochastic trend" in annual data. The former can be removed by "de-tending" the series, but the latter refers to a unit root (at the zero frequency). The most widely used procedure for testing for seasonal unit roots is that proposed by Hylleberg et al. (HEGY) (1990), and extended by Ghysels et al. (1994). In my graduate-level time-series course we always look at stochastic seasonality. Recently, Nicolas Ronderos has written a new "Add-in" for EViews to make it easy to implement the HEGY testing procedure (see here). This will certainly save some coding for EViews users. I plan to illustrate the application of seasonal unit root and cointegration tests in a future blog post. Beaulieu, J. J., and J. A. Miron, 1993. Seasonal unit roots in aggregate U.S. data. Journal of Econometrics, 55, 305-328. Engle, R. F., C. W. J. Granger, S. Hyleberg, H. S. Lee, 1993. Seasonal cointegration: The Japanese consumption function. Journal of Econometrics, 55, 275-298. Ghysels, E., H. S. Lee, and J. Noh, 1994. Testing for unit roots in seasonal time series: Some theoretical extensions and a Monte Carlo investigation. Journal of Econometrics, 62, 415-442. Hylleberg, S., R. F. Engle, C. W. J. Granger, and B. S. Yoo, 1990. Seasonal integration and cointegration. Journal of Econometrics, 44, 215-238. 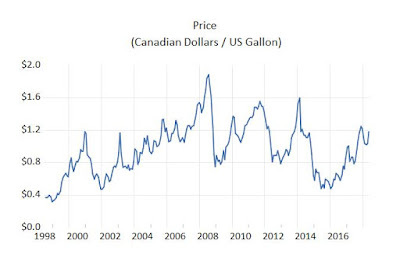 Allan Gregory, at Queen's University (Canada) has just started a new blog that concentrates on economic forecasting. You can find it here. "The goal is to discuss, compare and even evaluate alternative methods and tools for forecasting economic activity in Canada. I hope others involved in the business of forecasting will share their work, opinions and so on in this forum. Hopefully, we can understand the interaction of forecasting theory and practical forecasting." This is a blog that you should follow. I'm looking forward to Allan's upcoming posts. I was delighted by yesterday's announcement that Angus Deaton has been awarded the Nobel Prize in Economic Science this year. His contributions have have been many, fundamental, and varied, and I certainly won't attempt to summarize them here. Suffice to say that the official citation says that the award is "for his contributions to consumption, poverty, and welfare". In this earlier post I made brief mention of Deaton's path-breaking work, with John Muellbauer, that gave us the so-called "Almost Ideal Demand System". The AIDS model took empirical consumer demand analysis to a new level. It facilitated more sophisticated, and less restrictive, econometric analysis of consumer demand behaviour than had been possible with earlier models. The latter included the fundamentally important Linear Expenditure System (Stone, 1954), and the Rotterdam Model (Barten, 1964; Theil, 1965). I thought that readers may be interested in an empirical exercise with the AIDS model. Let's take a look at it. My thanks to a colleague for bringing to my attention a recent discussion paper with the provocative title, "Why Most Published Results on Unit Root and Cointegration are False". As you can imagine, I couldn't resist it! After a quick read (and a couple of deep breaths), my first reaction was to break one of my self-imposed blogging rules, and pull the paper apart at the seams. The trouble is, the paper is so outrageous in so many ways, that I just wasn't up to it. Instead, I'm going to assign it to students in my Time-Series Econometrics course to critique. They have more patience than I do! The authors make sweeping claims that certain theoretical results are undermined by one poorly implemented piece of (their own) empiricism. They provide no serious evidence that I could find to support the bold claim made in the title of their paper. The most positive thing I can say is: I can't wait for the promised follow-up papers! I've talked a bit about spurious regressions a bit in some earlier posts (here and here). I was updating an example for my time-series course the other day, and I thought that some readers might find it useful. Let's begin by reviewing what is usually meant when we talk about a "spurious regression". In short, it arises when we have several non-stationary time-series variables, which are not cointegrated, and we regress one of these variables on the others. In general, the result that we get are nonsensical, and the problem is only worsened if we increase the sample size. This phenomenon was observed by Granger and Newbold (1974), and others, and Phillips (1986) developed the asymptotic theory that he then used to prove that in a spurious regression the Durbin-Watson statistic converges in probability to zero; the OLS parameter estimators and R2 converge to non-standard limiting distributions; and the t-ratios and F-statistic diverge in distribution, as T ↑ ∞ . Let's look at some of these results associated with spurious regressions. We'll do so by means of a simple simulation experiment. Here's something that's very tempting, but it's not a good idea. Suppose that we want to estimate a regression model by OLS. We have a full sample of size n for the regressors, but one of the values for our dependent variable, y, isn't available. Rather than estimate the model using just the (n - 1) available data-points, you might think that it would be preferable to use all of the available data, and impute the missing value for y. Fair enough, but what imputation method are you going to use? and it's the nth value of y that's missing. We have values for x1, x2, ...., xn; and for y1, y2, ...., yn-1. Here's a great idea! OLS will give us the Best Linear Predictor of y, so why don't we just estimate (1) by OLS, using the available (n - 1) sample values for x and y; use this model (and xn) to get a predicted value (y*n) for yn; and then re-estimate the model with all n data-points: x1, x2, ...., xn; y1, y2, ...., yn-1, y*n.
Unfortunately, this is actually a waste of time. Let's see why. Quite out of the blue, Dan Getz kindly sent me a nice LaTeX version of my hand-written copy of "The Solution", given in my last post. Dan used the ShareLaTeX site - https://www.sharelatex.com/ . So, here's a nice pdf file with The Solution. Thanks a million, Dan - that was most thoughtful of you! You can find a solution to the problem posed in yesterday's post here. I hope you can read my writing! p.s. : Dan Getz kindly supplied a LaTeX version - here's the pdf file. Thanks, Dan! (a) Show that attempting to do this yields an “estimator” that can’t actually be used in practice. h[Var. (β*) / σ2] + (1 - h)[Bias(β*)/ β]2 , for 0 < h < 1. Is β* a legitimate estimator, in the sense that it can actually be applied in practice? The answer will follow in a subsequent post. Ahelegbey, D. F., 2015. The econometrics of networks: A review. Working Paper 13/WP/2015, Department of Economics, University of Venice. Camba-Mendez, G., G. Kapetanios, F. Papailias, and M. R. Weale, 2015. An automatic leading indicator, variable reduction and variable selection methods using small and large datasets: Forecasting the industrial production growth for Euro area economies. Working Paper No. 1773, European Central Bank. Cho, J. S., T-H. Kim, and Y. Shin, 2015. Quantile cointegration in the autoregressive distributed-lag modeling framework. Journal of Econometrics, 188, 281-300. De Luca, G., J. R. Magnus, and F. Peracchi, 2015. On the ambiguous consequences of omitting variables. EIEF Working Paper 05/15. Gozgor, G., 2015. Causal relation between economic growth and domestic credit in the economic globalization: Evidence from the Hatemi-J's test. Journal of International Trade and Economic Development, 24, 395-408. Panhans, M. T. and J. D. Singleton, 2015. The empirical economist's toolkit: From models to methods. Working Paper 2015-03, Center for the History of Political Economy. Sanderson. E and F. Windmeijer, 2015. A weak instrument F-test in linear IV models with multiple endogenous variables. Discussion Paper 15/644, Department of Economics, University of Bristol. This post is one of several related posts. The previous ones can be found here, here, here, here and here. These posts are based on Giles (2014). Many of the statistical tests that we perform routinely in econometrics can be affected by the level of aggregation of the data. Here, Let's focus on time-series data, and with temporal aggregation. I'm going to show you some preliminary results from work that I have in progress with Ryan Godwin. These results relate to one particular test, but work covers a variety of testing problems. I'm not supplying the EViews program code that was used to obtain the results below - at least, not for the moment. That's because the results that I'm reporting are based on work in progress. Sorry! As in the earlier posts, let's suppose that the aggregation is over "m" high-frequency periods. A lower case symbol will represent a high-frequency observation on a variable of interest; and an upper-case symbol will denote the aggregated series. Yt = yt + yt - 1 + ......+ yt - m + 1 . If we're aggregating monthly (flow) data to quarterly data, then m = 3. In the case of aggregation from quarterly to annual data, m = 4, etc. Now, let's investigate how such aggregation affects the performance of standard tests of linear restrictions on the coefficients of an OLS regression model. The simplest example would be a t-test of the hypothesis that one of the coefficients is zero. Another example would be the F-test of the hypothesis that all of the "slope" coefficients in such a regression model are zero. Consider the following simple Monte Carlo experiment, based on 20,000 replications. I've added a new page to this blog - it's titled "Readers' Forum". You'll see the tab for it in the bar just above the top post on the page you're reading now. "Please feel free to use the "Comment" facility below to provide questions and answers relating to Econometrics. I won't be able to answer all questions myself, but other readers may be able to help. The Forum will be "lightly moderated" to avoid spam and inappropriate content." Please note the italicized passage above. Every day, readers post (or attempt to post) lots of "comments" on the various posts on this blog. In many cases, these are not comments at all - they're questions, requests for assistance, and the like. All comments are moderated - I get to give them the "O.K." before they actually appear. That's just fine for genuine comments. Unless they're spam or contain inappropriate content, I invariably "approve" them right away. However, in the case of questions and requests I prefer to delay approval and post a response simultaneously. Regrettably, this has meant that, increasingly, there is often a delay in getting this out there. Sometimes, the requests are, quite frankly, unreasonable.I won't go into the details here, but let's just say that there's a difference between a blog and a free consulting service. I also try to be very careful when it's clear that the request comes form a student. I certainly don't want to get into a situation where I'm "getting between" that student and their instructor/supervisor. In short, I like to try and be helpful, but I can't keep up with the demand. I do have a job! Hopefully, the new forum will free up some time for me to focus on substantive posts, while still providing an opportunity for discussion. The Royal Economics Society (publisher of The Econometrics Journal) has recently released a video of invited addresses by Alfred Galichon and Jeremy Lise, in the special session on “Econometrics of Matching” at the 2015 RES Conference. This link will take you to all of these videos. The headline, "Don't Get Wrong Idea About Cholesterol", caught my attention in the 3 May, 2015 Times-Colonist newspaper here in Victoria, B.C.. In fact the article came from a syndicated column, published about a week earlier. No matter - it's always a good time for me to worry about my cholesterol! The piece was written by a certain Dr. Gifford-Jones (AKA Dr. Ken Walker). This post is for those readers who're getting involved with economic statistics for the first time. Basically, it serves as a warning that sometimes the formulae that you learn about have to be treated with care when it comes to the actual numerical implementation. Sometimes (often) there's more than one way to express the formula for some statistic. While thee formulae may be mathematically identical, they can yield different numerical results when you go to apply them. Yes, this sounds counter-intuitive, but it's true. And it's all to do with the numerical precision that your calculator (computer) is capable of. The example I'll give is a really simple one. However, the lesson carries over to more interesting situations. For instance, the inversion of matrices that we encounter when applying the OLS estimator is a case in point. When you fit a regression model using several different statistics/econometrics computer packages, you sometimes get slightly different results. This is because the packages can use different numerical methods to implement the algebraic results that you're familiar with. For me, the difference between a "good" package and a "not so good" package isn't so much the range of fancy techniques that each offers at the press of a few keys. It's more to do with what's going on "under the hood". Do the people writing the code know how make that code (a) numerically accurate; and (b) numerically robust to different data scenarios? I've blogged previously about specification testing in the context of Logit and Probit models. For instance, see here and here. If you're an EViews user, you can find my code for implementing a range of specification tests for Logit and Probit models here. These include the LM test for homoskedasticity that was proposed by Davidson and MacKinnon (1984). "When estimating a Logit or Probit model, we set the scale parameter (variance) of the error term to the value one, because it's not actually identifiable. So, in what sense can we have heteroskedasticity in such models?" Bajari, P., D. Nekipelov, S. P. Ryan, and M. Yang. 2015. Demand estimation with machine learning and model combination. NBER Working Paper 20955. Chambers, M. J., 2015. A jackknife correction to a test for cointegration rank. Econometrics, 3, 355-375. Mazeu, J. H. G., E. Ruiz and H. Veiga, 2015. Model uncertainty and the forecast accuracy of ARMA models: A survey. UC3M Working Paper 15-08, Statistics and Econometrics, Universidad Carlos III de Madrid. Paldam, M., 2015. Meta-analysis in a nutshell: Techniques and general findings. Economics, 9, 2015-11. Some of my previous posts have dealt with the issue of replicability - e.g., here and here. I had an email from Bob Reed today, alerting me to his involvement in the launching of The Replication Network. I knew that this was a big interest of Bob's, and it's great to see where things are going with this important venture. "I would like to invite you to consider joining The Replication Network (TRN). TRN is a website/community of scholars committed to promoting the use of replications in economics. For those of you who have seen an earlier version of the website, please note that the site has been thoroughly revamped in preparation for its “rollout” in June 2015. I think you will like what you see. You can check it out at :http://replicationnetwork.com/. For researchers interested in publishing replication studies, the website provides up-to-date information about (i) which journals encourage replication submissions, and (ii) a list of recently published replication studies that can serve as models of good practice. It also lists News and Events related to replications. Membership has its privileges. :-) Members can post their research on the website and are invited to contribute guest blogs related to replications. Members will also receive email updates every few months alerting them to new content on the website. There is no financial cost to join TRN, you will not be bothered with advertising or other spam, and you can easily unsubscribe if you later choose to. The main reason I encourage you to join TRN is because there is strength in numbers. If journals can see that there is a substantial readership of academics who support replication research and are interested in seeing it promoted, they may choose to change their editorial policies to include the publishing of replication studies. The lack of publishing outlets is the single biggest obstacle to the wider use of replication in economics. Thank you for giving this some thought. And feel free to forward this email to your colleagues. If you have any questions do not hesitate to contact me." I hope that readers will check this out and spread the word. 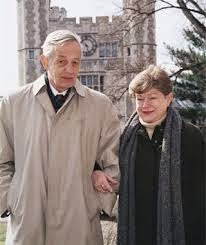 Tragically, John and Alicia Nash died as the result of a road accident on New Jersey yesterday. Just days previously, Nash was the co-recipient of the 2015 Abel Prize for his contributions to the theory of nonlinear partial differential equations. He was the only person to be awarded both the Abel Prize and a Nobel Prize (Economics, 1994). It would be impertinent of me to try and comment meaningfully, here, on Nash's contributions to Game Theory. Ferdinando is referring to Nash's Ph.D. dissertation, "Non-Cooperative Games", completed at Princeton University in May of 1950. Yes, it was just 27 pages long. One of the only two references was to von Neumann and Morgenstern's classic 1944 book, Theory of Games and Economic Behavior. The other was to Nash's own paper, published in the Proceedings of the National Academy of Sciences in 1950. It spanned just two pages, but was actually less than one page long! This post is prompted by a question raised by Irfan, one of this blog's readers, in some email correspondence with me a while back. The question was to do with imposing inequality constraints on the parameter estimates when applying maximum likelihood estimation (MLE). This is something that I always discuss briefly in my graduate econometrics course, and I thought that it might be of interest to a wider audience.